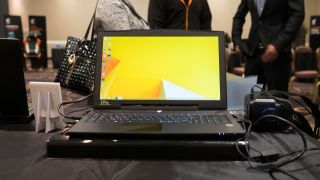 Over at Computex, Aorus has been showing off an addition to its 17.3-inch gaming laptop, the X7 DT, which now boasts an RGB keyboard. The RGB Fusion keyboard is a per-key backlit affair, meaning you can change the color of individual keys. This can allow for all manner of effects, such as highlighting particular keys (WASD for example), or you can use it for flashy illumination schemes which employ the backlighting to make patterns such as waves or ripples. In total, 16.8 million color variations are available, and the keyboard can also be programmed with macros, giving you all the expected gaming shortcuts you could wish for. This new RGB Fusion keyboard will be available with the next generation of X5 notebooks, too. The company is also making its limited edition 'camouflage design' military-style color scheme available across Aorus X3, X5 and X7 machines, for those who want something of an antidote to some of the brightly colored gaming machines we often see in the laptop world. The Aorus X7 DT boasts an overclocked Skylake Core i7 CPU which is backed up by an Nvidia GeForce GTX 980 graphics card that should provide plenty of pixel pushing power. That's a full desktop GTX 980 GPU, mind you, making this machine fully VR-ready, yet it still maintains a nicely thin frame at 25.4mm (with a weight of 3.2kg). We were impressed when we took the device for a hands-on spin earlier this year.